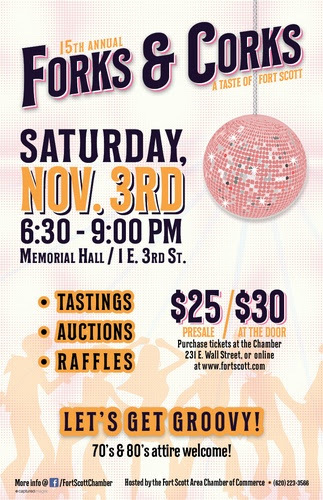 The 15h Annual Forks and Corks tasting event is this Saturday, Nov. 3 from 6:30 to 9 p.m. at Memorial Hall, 1 E. Third. The cost is $25 person, $30 at the door. A dozen Food vendors providing more than you can eat. Huge selection of Wines, from dry reds to dry whites to red, white, or pink sweet style wines! A great selection of Beers! A fun selection of Liquor and Liqueurs! Large selection of auction items and tons of FUN stuff going on. 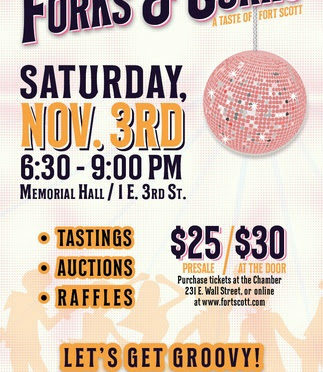 Save $5/per person..Advance tickets at Chamber or from a Chamber Board member.